"City of Weird" conjures what we fear: death, darkness, ghosts. Hungry sea monsters and alien slime molds. Blood drinkers and game show hosts. 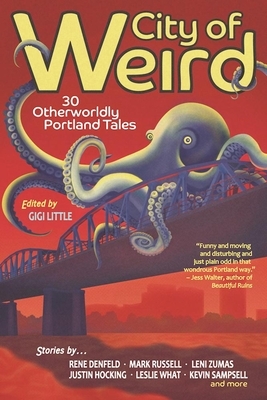 Set in Portland, Oregon, these thirty stories blend imagination, literary writing, and pop culture into a cohesive weirdness that honors the city's personality, its bookstores and bridges and solo volcano, as well as the tradition of sci-fi pulp magazines. Including such authors as Rene Denfeld, Justin Hocking, Leni Zumas, and Kevin Sampsell, editor Gigi Little has curated a collection that is quirky, chilling, often profoundand always perfectly weird. Graphic designer Gigi Little of Portland, Oregon, is the creative force behind Forest Avenue Press' visual identity. Outside of the domain of Forest Avenue, she has written and illustrated two children's picture books and her fiction and essays have appeared in anthologies and literary journals.